The Settlement method in Wallis can be illustrated by using the "Dorf" (village) Mühlebach as an example. 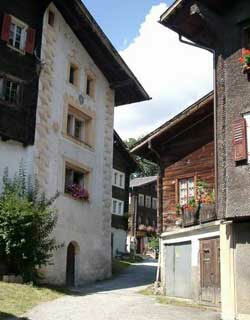 The compact "Dorf" built in the oldest timber construction methods of Switzerland. In the year 2002, a scientific study funded by the Swiss national fund and the Walliser Bauernhausforschung into the research of timber constructions led to some exciting results. On the basis of the year ring analyses (dendrochronology) twelve very old houses, so called "Heidehischer", were dated between 1381 and 1497. Among them, the birth house of cardinal Matthäus Schiner, the oldest building in the village and a living memory. Owing in part to luck over the centuries in avoiding fire and natural disasters, Mühlebach has the oldest Dorfkern (village centre) for timber construction methods in Switzerland. However, Mühlebach should not become a Musterdorf (sample village) for this reason. Houses and buildings are inhabited and used as before. In co-operation with the architect and architecture historian, Dr Roland Flückiger from Mühlebach\Bern, the local council made available a publication with the village plan. The “Red Thread” marked on the village plan leads you past the houses worth seeing. On the buildings, bronze plaques are attached to make the orientation for you easier. On each building you will find a short description with further references. Each house, barn and memory has its own story. The inhabitants of Mülhebach wish you good luck and hope you enjoy your walk around the Dorf (village) in which you will feel and see how the Dorf (village) has changed, adapted and developed in the last 500 years.